Who is your favorito! 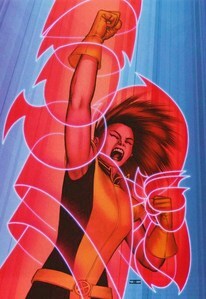 X-Woman? Who is your favorito! Marvel Superheroine? Who is your favorito! Avengers Woman? Out of all actrices portraying the marvel super heroines, which do tu think did the best job? Who Is Your favorito! Superheroine? Since I'm a superheroine fan, I thought I'd write an articulo about a superheroine that isn't often mentioned. Beware the Dinah-Soar! I am not very good at judging comic libros because since I live in Sweden I don't get to read any except Amazing Spider-Man since that is the only one that is translated over here, but I have started to buy imported Graphic Novels and Trades of American comicbooks and I just feelt like making a review on one of the ones I liked the most. Inspired por IGN.com, I will create a competition that will battle Marvel Women face to face to see who is victorious. The Battle of the Comic Book Babes will put two female characters against each other, with the users (that you) to select your favorito! from the two. Please consider the characters powers, persona, looks and role in the Marvel Universe in consideration when making your decision. I will lista a couple of female characters, and I will leave the rest up to the fanpopers to add =]. Hope this is successful, =] it should be lots of fun. registrarse this facebook group to save Wolverine and the X-Men so we can see más of our favorito! X-Men heroines. a comment was made to the poll: Out of my favorito! Femme Fatales in Marvel which do tu like better.